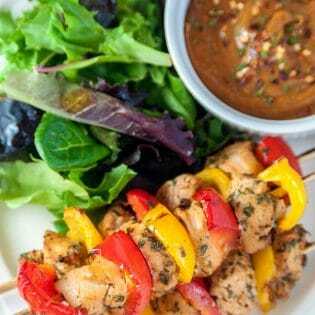 Kickin' Chicken Kebabs with Spicy Peanut Sauce. If you're looking for a spicy chicken kebab recipe that hits you with flavor and not heat then you need to try this new dinner favorite. It uses Valentina Mexican hot sauce so it's not overly spicy. Add yellow and red peppers to the skewer to get your veggies in! Add the olive oil, hot sauce, honey, liquid aminos, garlic, and salt and pepper in a medium/large bowl. Add the chicken breasts, cover and refrigerate for at least two hours. The longer, the better. If you're using wooden skewers, soak them in water while the chicken marinates. Arrange the skewers with chicken-pepper-chicken or pepper-chicken-pepper. It really doesn't matter. Grill for 3-4 minutes each side, or until no longer pink. If baking - bake for 35-40 minutes at 375. While the chicken is grilling, throw together the sauce. Add all the ingredients together and serve with spicy chicken kebabs.